Presentation is an important feature in any community. Among the areas that receive a great deal of public attention are the local streets, byways and parking lots, as well as the central business district. Many communities and businesses that are attempting to maintain a clean and dirt-free environment have also found that maintaining their own fleet of street sweepers and catch basin cleaners can be a costly proposition. 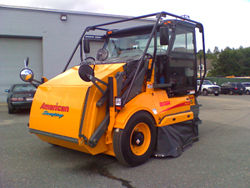 The principals at American Sweeping have been providing cities and towns, contractors and commercial/industrial accounts with cost effective street sweeping, and catch basin cleaning for years. The communities and private firms we have served have saved thousands of dollars simply by eliminating large capital outlays for expensive machines and lost time due to mechanical failure. The American Sweeping program also allows for better utilization of personnel. You will find the cost of these programs is competitive and that they are available on a per-project or long-term contract basis. The conservative fiscal mood evident in municipalities today makes it even more appealing for those communities to seek more cost-efficient methods from outside vendors. Equipment maintenance, parts and down time due to repairs are major factors in determining whether to acquire these services on a contractual basis. Once the contract is in place, the municipality or industrial account is relieved of administrative problems regarding personnel, maintenance and scheduling. 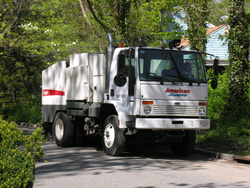 A typical contract may call for sweeping by the curb mile, by the hour, or for the continuous maintenance of streets, as well as emergency sweeping. Clients who have switched to “outsourcing” have eliminated the major equipment purchases and costly financing which would otherwise limit their future financial capabilities. When you contract with American Sweeping you know exactly how much work will be done because you design the program. You know what it will cost ahead of time. Costly repairs, replacements, vacations, injuries, and other personnel problems will no longer affect the budget or level of service you have been promised. If funding goes up or down, future contracts can be tailored to meet cash flow and help to maintain a balanced budget. American Sweeping may even purchase your existing equipment and apply its value toward the contract, further reducing your costs. Municipalities should insist on the newest, most modern equipment when contracting. With American Sweeping, you always get the newest technology available. 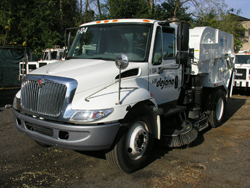 Sweepers used on municipal contracts are never over five years old, with the average age of American’s fleet just over two years old. The age of our equipment is a major reason American Sweeping is able to maintain high levels of production without breakdowns typically associated with older equipment.